If by chance one happened to have been in Zurich, Switzerland, this past September and October (2018), one would have had a once in a lifetime opportunity to view a collection of Japanese national treasures that had never been shown outside of their homeland. 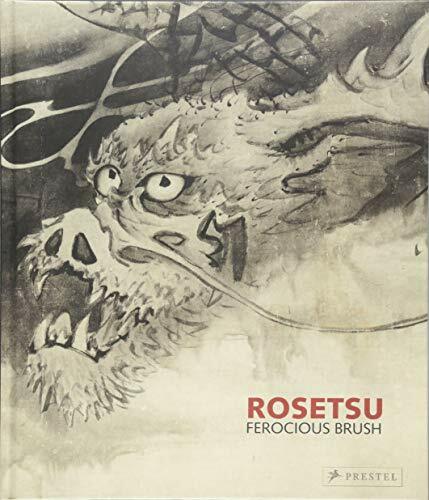 By now dispersed and returned, this rare and fleeting exhibition experience will live on in its stunning and robust catalog Rosetsu: Ferocious Brush. Not often included in Western Art History canon, Eastern Art is a category considered separate and unique, or worse indecipherable, unintelligible, unrelatable, and easily dismissed. This tendency couldn’t be farther off course considering the influence 19th century European artists attributed to Japanese prints and the ensuing pop-culture rage of Japonisme. Edo artists such as Katsushika Hokusai (1760–1849) became international celebrities with The Great Wave off Kanagawa and his Thirty-Six Views (c. 1831) series. Heavy hitters like Degas, van Gogh, Monet, Renoir, and Cézanne were all smitten. The Eastern became indelibly intertwined with the Western. Nagasawa Rosetsu (1754–1799) was Hokusai’s contemporary and another of the great Edo-era artists although he was from Kyoto and not Edo (Tokyo). Most likely Rosetsu is not as well known because he lived 45 years to Hokusai’s 89 and passed away just on the brink of popularity. What is known about Rosetsu’s upbringing and artistic training is briefly described in the catalog’s two essays, which sharply delineate the artist’s productive output into two specific periods. In the Nanki Period (1786–1787), when Rosetsu traveled to the Nanki coastal region 120 miles south of his base in Kyoto to paint commissions in three different temples, his stylistic tendencies resembled the artistic school of his teacher. And after Nanki, the time span between when he left Nanki until his death, Rosetsu’s creative inhibitions were dropped and his paintings take a wildly creative turn. Throughout the writings it is evident that Rosetsu was a dedicated virtuoso with a sense of humor and a refined intellect. His abilities ranged all sizes from a one-inch square paper painting to a 36-foot-long silk hand scroll to temple-sized screen panels. His themes included animals, flowers, figures, and calligraphic collaborations. His style was at times naturalistic, serious and refined, and at other times scratchy, abstract and inebriatedly jovial. He seems to have been the type of person who could schmooze with the affluent upper crust when necessary and be the life of the party, the congenial and entertaining houseguest. As intelligent and informative as the essays are, the true appeal is in the section called Catalog. In it are the 60 artworks that represent Rosetsu’s oeuvre in the exhibition. As hard as it is to visualize their size and the magnificent spectacle these pieces must achieve in situ, the reproductions are about as good as they could possibly be. Each artwork is given a full page, or even a fold out, and many have enlarged details. McKelway and co-contributor Khanh Trinh take turns with the descriptions that accompany each piece. Flipping along chronologically from 1782–1799 it is magical to see how dramatically unique and personal Rosetsu’s work became. The tragedy of a life cut short is that there is no way to determine just how much more unique and personal Rosetsu’s paintings would have stretched; how deep and how boundless was his imagination? Would he have pushed the edges of the Japanese avant-garde? Would he have become an international sensation with galleries and dealers clambering for every little scrap and scribble like Hokusai experienced? He was in demand in the Imperial Palace, in prominent Zen monasteries and with wealthy collectors. Rosetsu was “flourishing.” He “set his own artistic agenda,” had a “distinctive vision,” and incorporated both the traditional and the modern. There is no reason not to think he was on his way to breaking out beyond Japan’s borders. Instead, he left behind a national legacy with many followers keeping his name alive. Now his name has finally made its way to the great neutralizing and unifying grounds of Zurich. In a project that is much overdue, Rosetsu: Ferocious Brush will continue to promote this masterfully exciting artist to a much broader audience and help narrow the perception gap between Eastern and Western art.